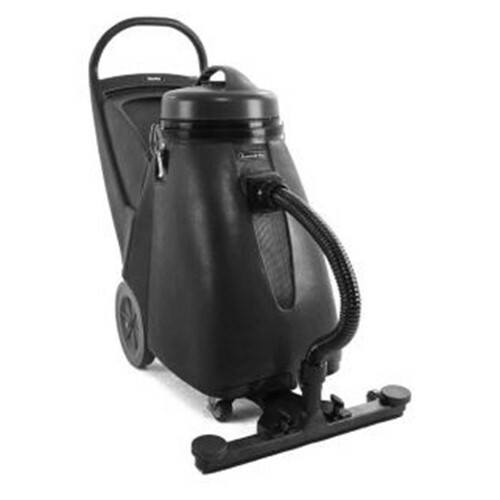 The Summit Pro 18SQ offers great performance and value in a wet/dry vacuum. The high capacity tank and integrated front-mounted squeegee assembly with rear foot pedal actuator allow high productivity water pick-up for big jobs. And when the need is for tools that can pick up dust and get into tight places, there is a complete tool kit with 9 ft hose and rugged stainless wand. A large on-board storage area resides in the handle assembly, making this one of the most versatile wet/dry vacuums available. 10 inch stair climbing wheels. Clean easily with the 9 foot vacuum hose and 5 piece complete contractor tool kit including: crevice tool, dusting brush, wet and dry pick-up tools, and 3 piece stainless steel wand. Engineered to withstand heavy, daily use in schools, office buildings, medical facilities and other commercial applications. 24 inch front-mount squeegee assembly, 9 foot hose, and 5 piece contractor tool kit included. Includes 5 piece tool kit, 9 foot hose and stainless wand with on-board storage.